STEM teacher supply. Skills shortages. Shifting demographics. The Baptism barrier. Ambitious Action Plan objectives. 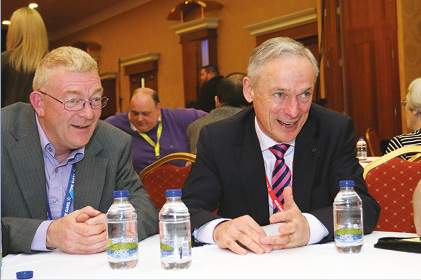 Ciarán Galway speaks with Education Minister Richard Bruton amidst a testing time for Irish education. Reflecting on his time in the portfolio, Minister for Education Richard Bruton contends that there have been a number of significant achievements. Under his Department’s three-year Action Plan (2016 to 2019) a total of 6,000 extra teachers and 3,000 special needs assistants are set to be employed. “That has really made a difference to the learning environment,” he says. In terms of disadvantage, there are fewer students dropping out of Delivering Equality of Opportunity in Schools (DEIS) than ever before alongside a 32 per cent increase in the number of people progressing from disadvantaged backgrounds into third-level. The Minister suggests this indicates that “we are catching disadvantage”. “For children with special needs we have also rolled out a new approach that no longer requires a child with special needs to have a diagnosis, a badge on their back, to get access to support. That has been really welcomed in the schools as having an impact. “On the wider interface between education and the world of work, we have 59 new apprenticeships in the pipeline, we are rolling out the technological university legislation which will see new drivers of skills in the regions. We’re putting investment in behind that – we have a €200 million PPP package of investment in institutes of technology,” he details. In February, the second annual plan within the Action Plan for Education Framework 2016-2019 was published. Identifying education as “the heart of all our ambitions as a nation”, the latest plan asserts that 86 per cent of the actions targeted for the end of 2017 were delivered and outlines an additional 370 actions and sub actions for 2018. • building a bridge between education, enterprise and the wider community. The way to measure progress against these five goals, Bruton explains, is to focus on outcomes. “We measure outcomes in each of those areas. We are also looking at the policy tools which will drive us on. For example, we have restored guidance counselling, we are investing in wellbeing programmes and we are investing in senior cycle computer science and PE. This drags investment into the areas we want to make an impact. These clusters, supported under the School Excellence Fund, are aimed at encouraging talented leaders within education to maximise their impact, not only in their own schools, but beyond. Having previously been critical of existing admissions rules for oversubscribed schools, commonly referred to as ‘the baptism barrier’, forthcoming Government legislation will ban waiting lists which, Bruton states, “has been a source of unfairness”. “We are also moving to remove religion as a criterion for selection from the vast majority of schools so that people won’t feel that someone from a distant location will get preference in a local school because they happen to be of a particular religious background. For the minority religions, which represent around 5 per cent, we will ensure that they get that access,” Bruton outlines. “Schools have a responsibility to accommodate and be open to all children. If they are not honouring that, we are also legislating for the power to designate a school to facilitate a child with SEN,” he adds. The Education Minister takes exception to the suggestion that schools are having difficulty in attracting qualified teachers to fill STEM and language posts. “I think the first thing to say is that there aren’t problems in filling posts. We have already employed 5,000 extra teachers and there are 3,000 teachers graduating each year,” he maintains. One measure aimed at achieving this is incentivisation aimed at delivery in these ‘pinch points’. 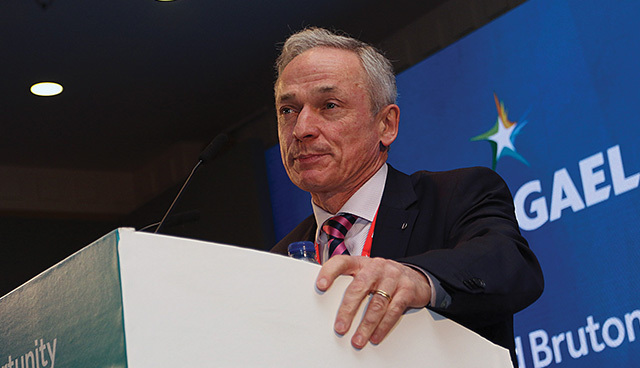 When asked if this indicated the introduction of quotas for undergraduate and postgraduate teacher training course numbers in particular subject areas, Bruton states: “It would mean, if we need to see an extra 5 per cent of people doing STEM subjects, then we would take steps to create an expansion in those programmes at the cost of areas where we are plentiful. Overall, while conceding that ‘pinch points’ in the teaching supply, the Minister’s central tenet is that “it remains a very good profession and I’m very ambitious for teaching to modernise itself, apply new digital technologies and a good many exciting things are happening in the teaching world at the moment”. While acknowledging that teachers’ unions regard the wage gap between those employed before and after January 2011 as “unfinished business”, Bruton emphasises his budgetary strains. “I suppose for a government, we have to balance different demands. I’ve had to invest in new teachers, in special education and all those items I’ve mentioned earlier and I have to balance that against the legitimate demand for extra pay. In pursuing a greater link between education and enterprise, apprenticeships are set play a crucial role. The Minister outlines plans to treble the number of apprenticeships and double the number of traineeships in order to provide entirely new alternative pathways for young people to reach their learning potential. “In practical terms, this is what ‘the republic of opportunity’, as the Taoiseach refers to, is about. That means opening new pathways for people to get to success in a changing world. There are real opportunities for apprenticeships, including 59 entirely new trades coming on stream which will encompass insurance, data protection, computer animation and many more right across the employment spectrum. There are so many new areas where we can develop the earn-as-you-learn model and embed learning in a practical enterprise environment, alongside college,” he explains. 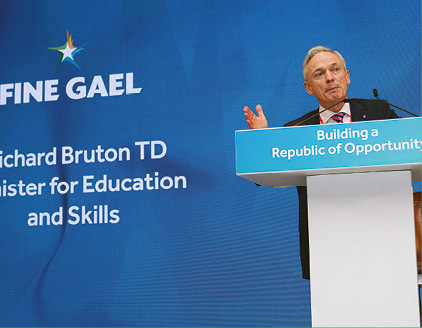 Currently, record numbers are enrolled in third-level education, while, as Bruton asserts, apprenticeships have become unappreciated in Ireland. “Obviously, we don’t have the culture which exists in places like Germany and Austria in terms of guilds and employers embedded in learning as part of a social partnership. So, we have had to create it. The Government is committed to the establishment of amalgamated and augmented institutes of technology in the form of technological universities. Responding to a query on the rationale for such developments, the Minister emphasises the wider economic health of the nation. Delivering in further and higher education requires significant investment. The Government has committed additional exchequer money and raised the National Training Fund levy by 0.1 per cent in three incremental annual phases from 0.7 per cent in 2017 to 1 per cent by 2020. The Minister contends that a “more dramatic change” is occurring in capital investment. “We did have an investment programme of €110 million for the next four years and that has now gone up to €367 million. It represents a very significant step up in the level of investment we can make in the education facilities for the future. “The third piece of the jigsaw is that we have now reformed the way in which money is allocated to colleges in order to incentivise the sort of changes we need: meeting the skills gap, encouraging more innovation, reducing dropout rates, attracting people from disadvantaged backgrounds and embedding with local enterprises,” he says. However, the Minister does not dismiss the introduction of a student loans system. “The proposal that came from Peter Cassells wasn’t a UK-style model, I think it was more likened to an Australian model, but it was a student loan and the idea was that students would move away from upfront fees to this income contingent loan, that they would pay after they qualify. Looking to the future, Minister Bruton concludes: “The merit of the action plan is that we’ve set a long-term goal, a 2026 goal, nine years away, to be the best in Europe. We know what that means. We are already best in significant areas. Our ten-year-olds are the best in literacy and maths in Europe. “We have set goals in all areas: creating a better learning environment, better at dealing with disadvantage, better at building links to the wider world and better at creating continuous improvement. We are investing in all of those, so I will be looking to improved outcomes in each of those areas.